TREASURER Josh Frydenberg has labelled those responsible for vandalising his election campaign posters with antisemitic graffiti as "cowards". The British Labour Party used to be at the forefront of the fight against fascism and Nazism. Today, however, it's unrecognisable from its wartime predecessor, writes Uri Butnaru. This righteous decision communicates the message that Australia stands for better, that it will continue to be a safe haven for us all, and that the likes of David Icke are not welcome here. 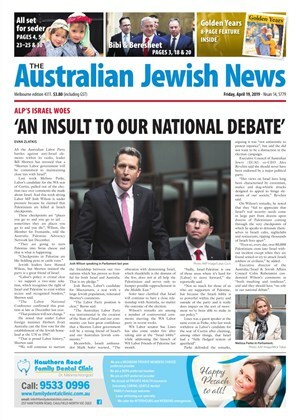 After participating in the AUJS Holocaust Education Tour, I am now confident that AUJS will no longer protest against antisemitism on campus alone. Jewish MP Luciana Berger was among seven Labour MPs in the UK who this week resigned from the party in protest at Jeremy Corbyn's handling of complaints surrounding antisemitism and Brexit. 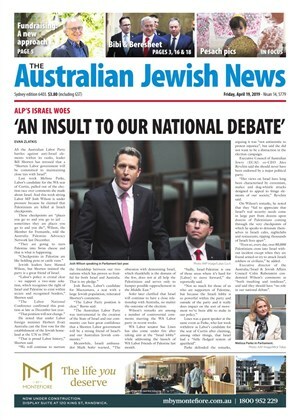 The Australasian Union of Jewish Students (AUJS) was recognised on the international stage when the organisation won the Campaign of the Year award at last week's World Union of Jewish Students Congress. A Jewish-Muslim initiative that provides training on how to safely respond to a hate attack was launched at Melbourne's Immigration Museum on December 10.